How formatting from Windows Setup disc looks on the screen. A very easy way to format C is by using a Windows Setup disc as a formatting utility. Since most people have a Windows Setup DVD lying around, this method to format C is probably the quickest because there's nothing to download or burn to disc. A Windows XP Setup Disc or Setup Disks will not work - you must use a Windows 7 Setup DVD or a Windows Vista Setup DVD to format C this way. It doesn't matter what operating system is on your C drive (Windows XP, Linux, Windows Vista, etc.). One of those two DVDs will work. If you can't get your hands on one of these discs, see How to Format C for more options. Follow these steps to format C drive using a Windows Setup DVD. You will not be installing Windows 7 or Windows Vista and will not need a product key. We'll stop the setup process before Windows begins to install on the computer. This is easy, but it will probably take several minutes or longer to format C using a Windows Setup disc. Here's how. Boot from the Windows 7 Setup DVD. Watch for the Press any key to boot from CD or DVD... message after your computer turns on and be sure to do that. If you don't see this message but instead see the Windows is loading files... message, that's fine, too. We wrote these steps with the Windows 7 Setup DVD in mind but they should work equally well for a Windows Vista Setup DVD. Wait for the Windows is loading files... and the Starting Windows screens. When they end, you should see the big Windows 7 logo with several drop-down boxes. Change any Language or Keyboard options if you need to and then click Next. Don't worry about the "loading files" or "starting Windows" messages being literal. Windows is not being installed anywhere on your computer - the setup program is starting, that's all. Click the big Install now button the next screen and then wait during the Setup is starting... screen. Again, don't worry -- you won't really be installing Windows. Check the box next to I accept the license terms and then click Next. Click on the big Custom (advanced) button. You should now be on the Where do you want to install Windows? window. This is where you'll be able to format C. Click the Drive options (advanced) link under the list of hard drives. As you can see, several other options are now available, including Format. Since we're working from outside of the operating system installed on your computer, we can now format C.
Choose the partition from the list that represents your C drive and then click the Format link. The C drive will not be labeled as such. If more than one partition is listed, be sure to choose the correct one. If you're not sure, remove the Windows Setup disc, boot back into your operating system, and record the hard drive size as a reference to figure out which partition is the correct one. You can do that by following this tutorial. If you choose the wrong drive to format, you could be erasing data you want to keep! 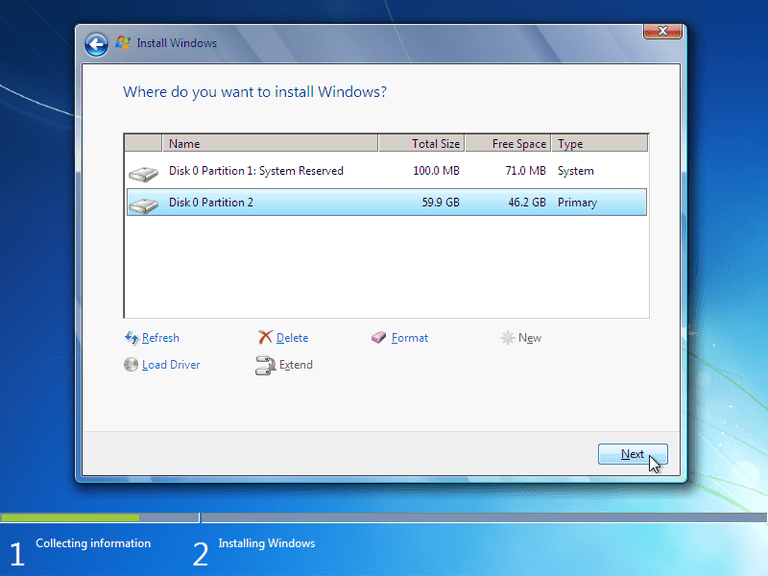 Some operating systems create more than one partition during setup, including Windows 7. If your intention for formatting C is to remove all traces of an operating system, you may want to delete this partition, and the C drive partition, and then create a new partition that you can then format. After clicking Format, you're warned that what you're formatting "...might contain recovery files, system files, or important software from your computer manufacturer. If you format this partition, any data stored on it will be lost." Take this seriously! As pointed out in the last step, it's very important that you're sure this is the C drive and that you're sure that you really do want to format it. Your cursor will turn busy while Windows Setup is formatting the drive. When the cursor turns back into an arrow, the format is complete. You are not otherwise notified that the format is over. You can now remove the Windows Setup DVD and turn off your computer. As you should have understood from the beginning, you remove your entire operating system when you format C. This means that when you restart your computer and attempt to boot from your hard drive, it will not work because there's no longer anything there. What you'll get instead is a BOOTMGR is missing or an NTLDR is missing error message, meaning there was no operating system found. When you format C from a Windows 7 or Vista Setup disc, you don't truly erase the information on the drive. You only hide it (and not very well) from a future operating system or program! This is because a format performed this way from the setup disc is a "quick" format which skips the write-zero portion performed during a standard format. See How to Wipe a Hard Drive if you want to actually erase the data on your C drive and prevent most data recovery methods from being able to resurrect it.